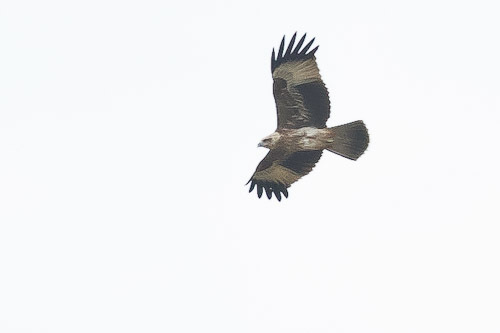 My last day in Stung Treng only yielded an Eastern Marsh-harrier. I jumped on the minivan to Ban Lung. The road was excellent all the way and there was lots of open forest on the way. Plenty of scope for someone to explore all that bush. My guest house was on the shores of Lak Kan Saign, and in the afternoon I borrowed a bicylcle and went around the lake looking for birds. 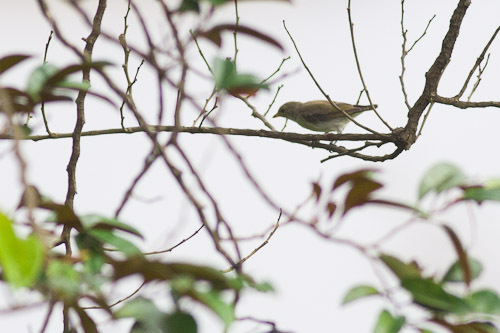 There were not many about, so I ventured up a hill and down into a valley but found nothing except lots of Red-whiskered Bulbuls. 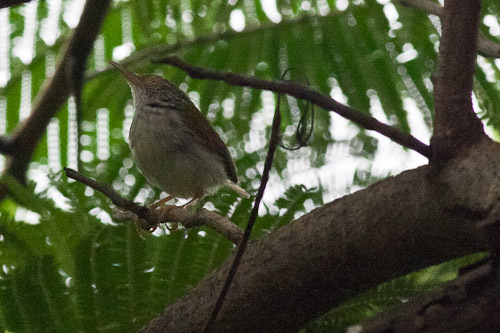 A few Dark-necked Tailorbird (Orthotomus atrogularis) were in the trees just above the lake. 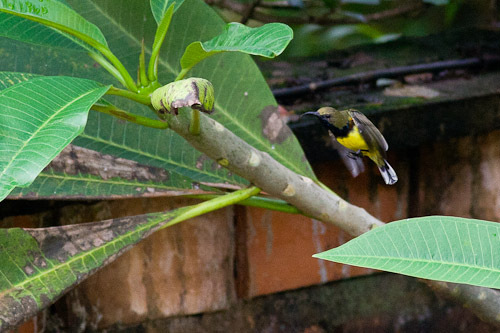 They were flittering around ferociously and it was really difficult to photograph them. 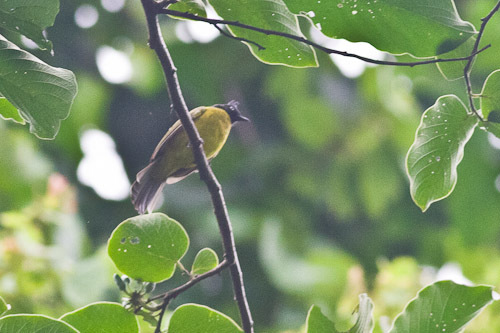 I went up the hill to where there was a church and saw a male Olive-backed Sunbird (Cinnyris jugularis), coming out of eclipse plumage. 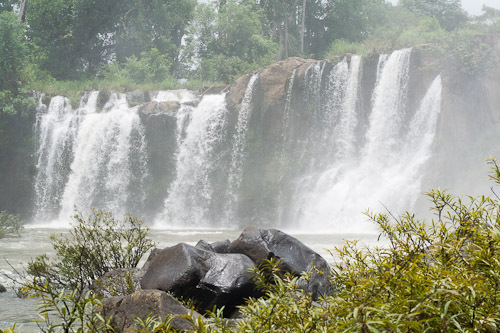 Yeak Laom is located four kilometers east of Ban Lung, the capital of Ratanakiri province in North-east Cabodia. The center piece of the area is Yeak Laom Lake, a volcanic crater lake believed to have been created about 700,000 years ago. The present day lake is 800 meters acrss , more than 50 meters deep at the center and surrounded by forest to the top of the crater rim. 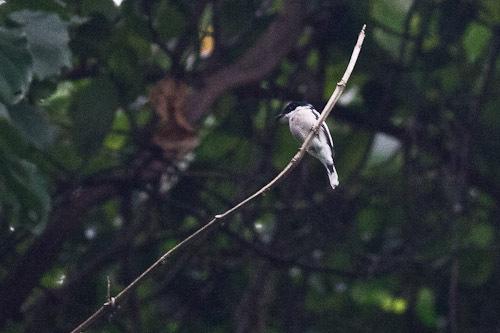 Black-headed shrike-babbler ? 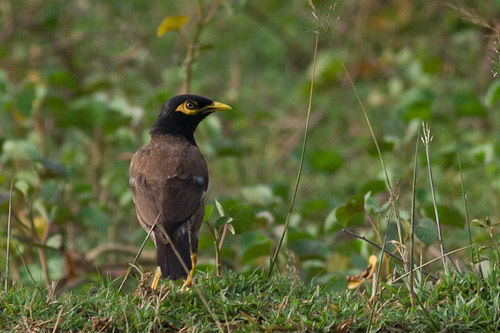 rufous-tailed shama ? I am not quite sure what this is. I poured through the book, but could not find anything that resembled this bird. I was stumped. 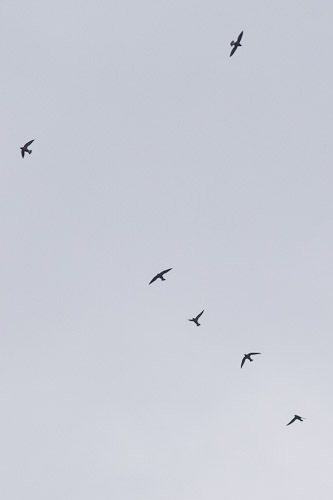 There were heaps of Brown-backed needtletail (Hirundapus giganteus) circling overhead. 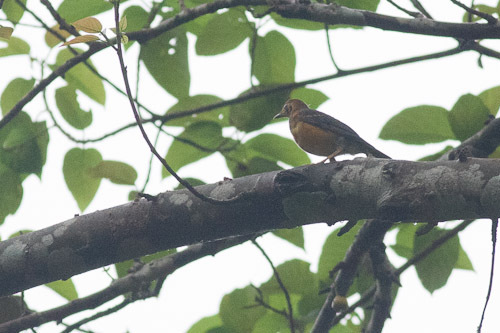 The forest around the lake was very thick and the sky was overcast, so photography was difficult. But at least it was nice and cool. 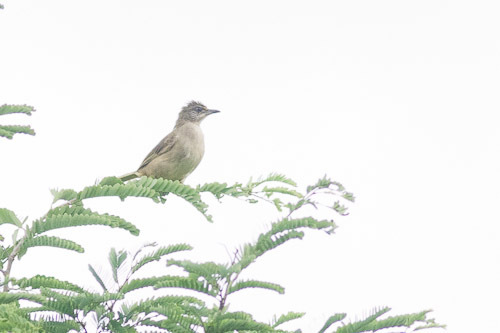 It took me a while to work out that this was a Bar-winged Flycatcher-shrike (Hemipus picatus). 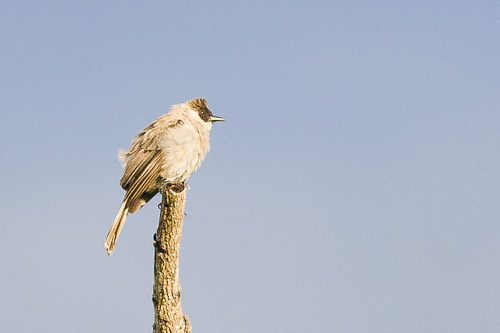 I looked at similar birds such as Black-winged Flycatcher-shrike – no, Pied Triller – no and Little Pied Flycatcher – no. 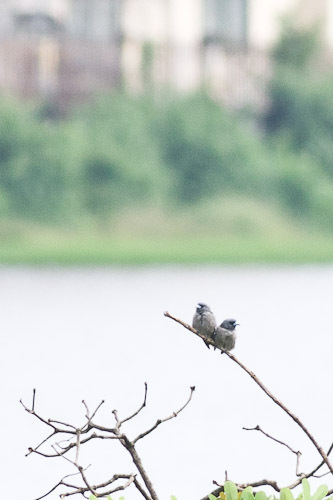 Later that morning I went back to Lake Kan Saign again and saw some Ashy Woodswallow (Artamus fuscus) perched on trees near the water. 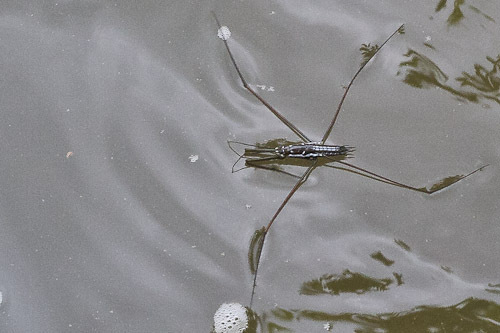 I could not get any closer because it was all swampy along the lake. 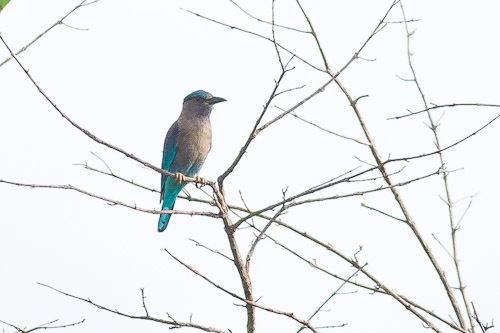 There were a few birds in the trees along the road around the lake and I also spied a White-throated Kingfisher (Halycon smyrnensis) perched near the water. 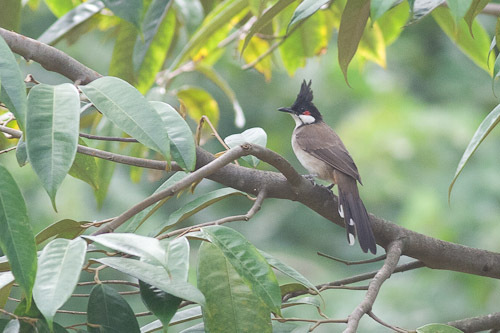 Back at the guest house, I spotted a Red-whiskered Bulbul, a squirrel and a male Olive-backed Sunbird (Cinnyris jugularis) and photographed them from the balcony. 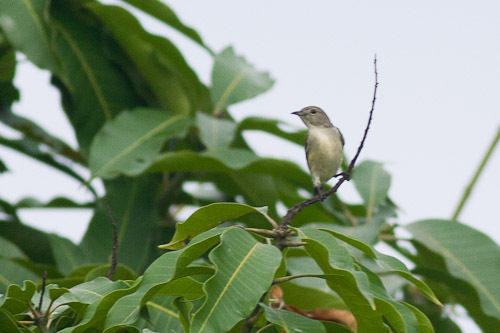 Bar-winged Flycatcher-shrike (Hemipus picatus) yes. 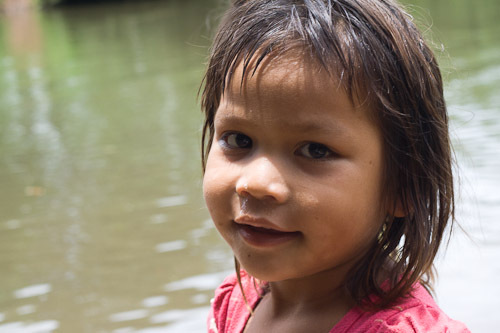 Mekong River Discovery Trail, Cambodia. Back along the Mekong River Discovery Trail this morning. I started off early but it seemed like it was going to be a slow morning. 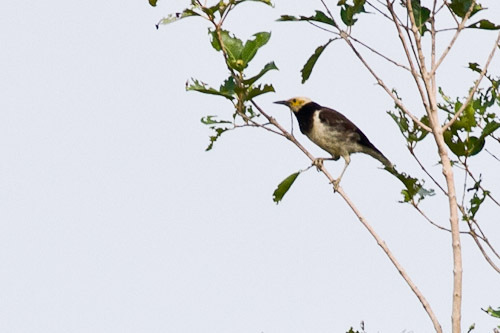 I saw a male eclipse Olive-backed Sunbird (Cinnyris jugularis) impersonating a humminbird by hovering around some branches, a few Spotted Dove (Geopelia chinensis) and the usual Common Myna (Acidotheres tristis) or three. 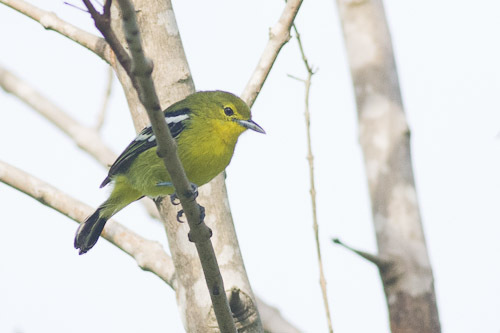 I think this is the best shot I have got of a Common Iora. Two for the price of one in this photo. 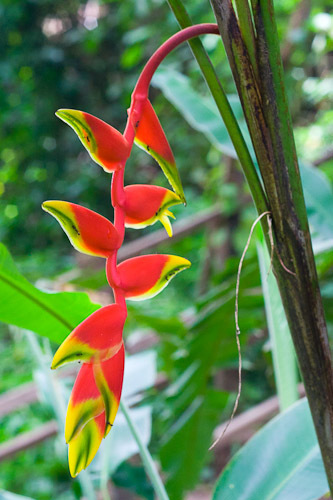 I managed to get aoneblurry photo of a Greater Flameback (Chrysocoloptes lucidus) in flight. Shame its no good. I just kept seeing all these new birds. It was awesome. I have not ticked them off yet but I got quite a few today. 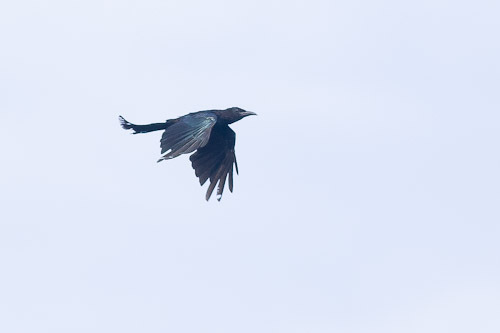 Black Drongo (Dicrurus macrocercus) in flight. 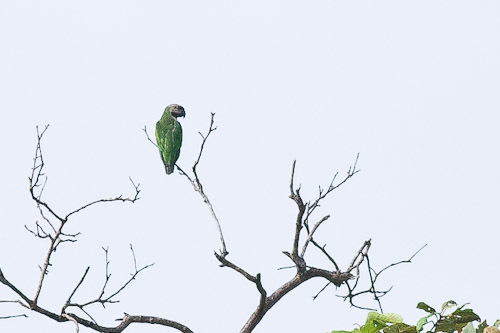 I had been seeing these parrots flying past for the past two days but had been unable to get a shot of them. Until now. I was stoked when i saw this. 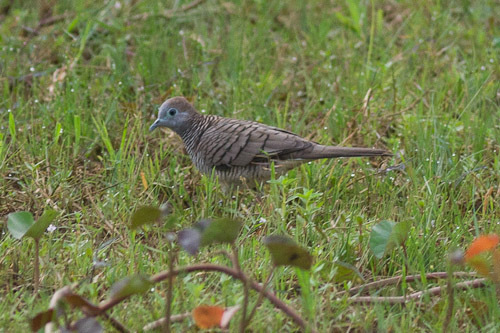 First parrot type bird since Malaysia I think. The Changeable Hawk-eagle (Nisaetus cirrhatus) also has been called by the scientific name of Spizaetus cirrhatus – so take your pick. In my humble opinion this bird is a juvenile pale morph. I think he has a chicken in his talon. 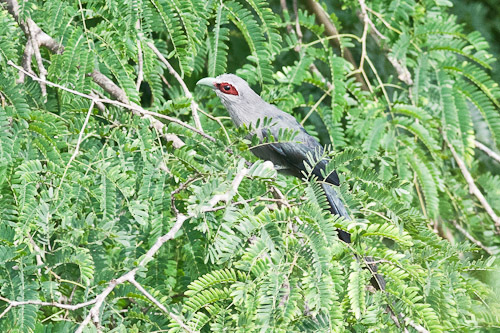 The drongos were harassing him. Flying around him in flight and flying at him when he roosted in a tree. What a magnificent raptor! 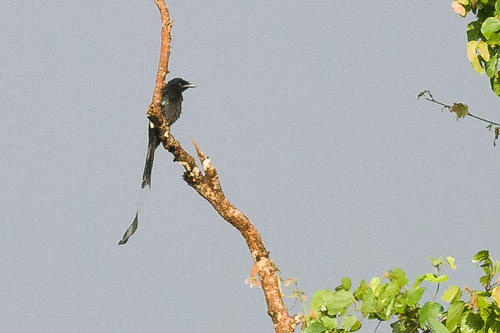 This Black Drongo was having a good old yell at the Changeable Hawk-eagle and later chased it off to another tree. 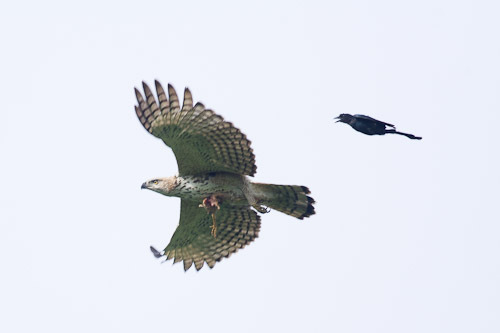 The when the Changeable Hawk-eagle got to another tree, he got harassed by a Greater Racket-tailed Drongo. Them drongos sure do stick together. 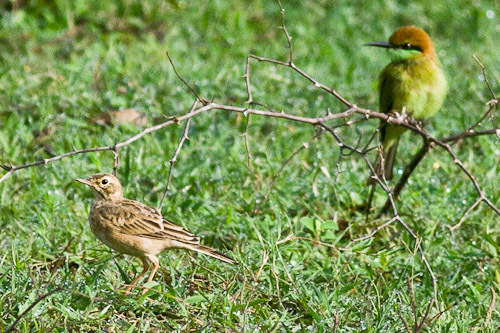 After this photo, the Chestnut-headed Bee-eater swooped down and caught a dragonfly. They are incredible hunters. And of course, the Chestnut-headed Bee-eater does not have a tail extension like other bee-eaters. 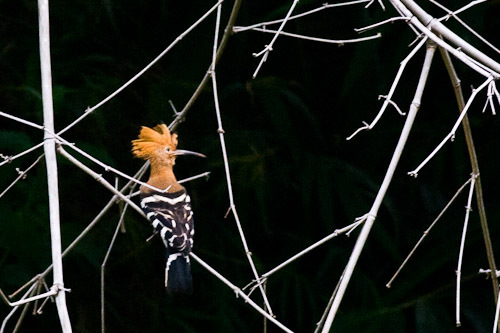 The Common Hoopoe (Upupa epops) is a very strange looking bird with its long bill, black-marked crest flying high in the air like a mohawk, and its back covered in black and white bands. With a main colour of pinkish buff. 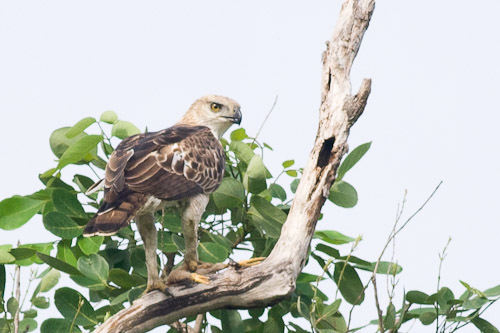 I took this photo of a juvenile Eastern Marsh-Harrier (Circus spilonotus) whilst walking around on the outskirts of Stung Treng town. 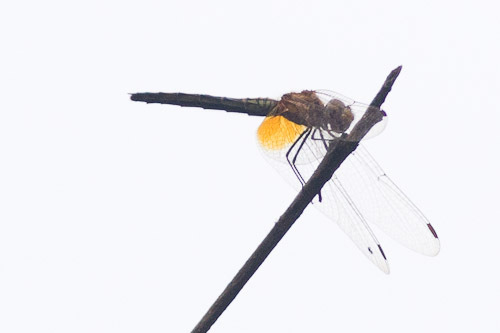 It was hovering over the edges of the river, circling and moving north up the Mekong, away from the mouth of the Sekong River, where Stung Treng is situated. As you can see, I am now in Cambodia. 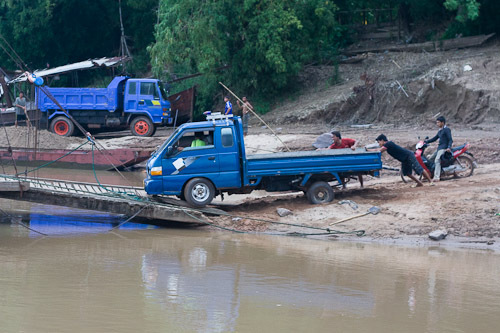 I got a VIP bus from Don Det in Laos, paid the suitable amount of bribes to get over the border, and here I am. 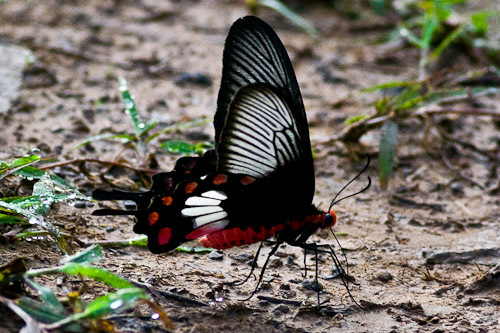 First day birding in Cambodia and it is already ten times better than Laos. It is remarkable the difference. 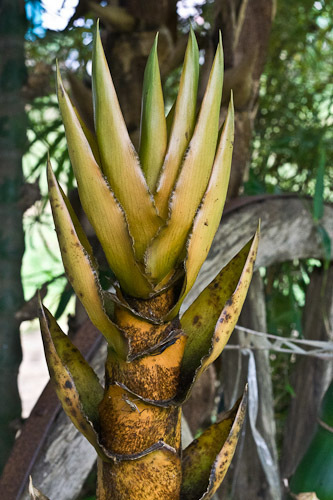 I went north of Stung Treng and stayed at the Mekong Bird Lodge. That afternoon I followed the path behind the lodge that follows the Mekong River. 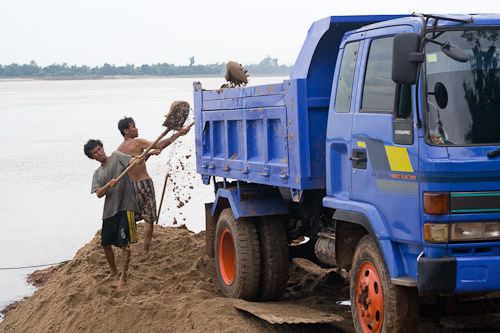 It is part of the Mekong Discovery Trail, a system of bike roads and trails that traverse the northern part of the Mekong in Cambodia. 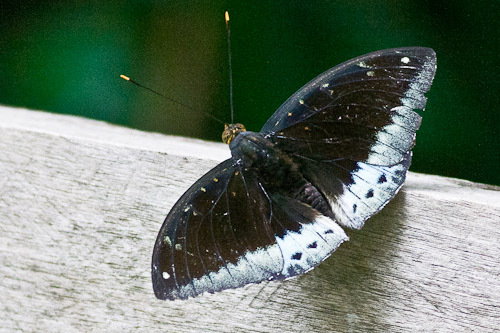 I was not sure if this was a female Purple or not, but today was the clincher when I got some shots of an eclipse male. 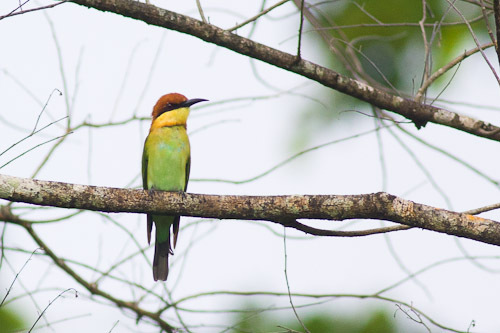 There were a few Little Green Bee-eater (Merops orientalis) catching some grasshoppers as well as a few Chestnut-headed Bee-eaters (Merops leschenaulti) as well. I got decent photos of them today so wait for the next installment. The kids along the track kept shouting out “Hello, hello” and I think I said hello about fifty million times. The people were very nice. It poured rain a couple of times and I had to shelter under a house. They are all on stilts, luckily. 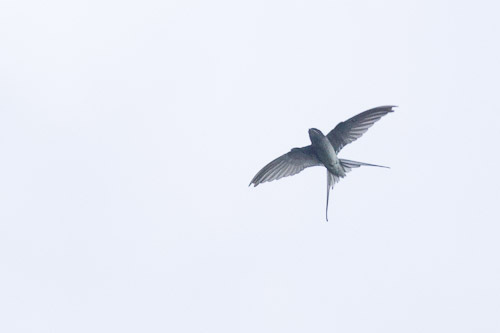 The Barn Swallows were wheeling nice and slow overhead so I was able to get some reasonable shots. 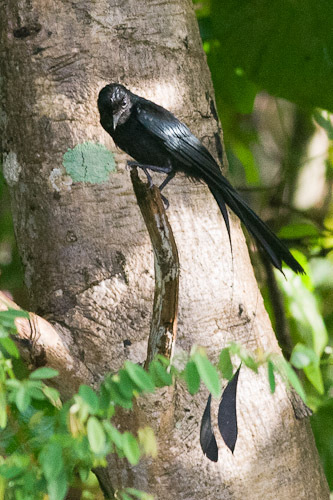 They were quite a few Greater Racket-tailed Drongo (Dicrurus paradiseus) around. This one is a juvenile because he has a light streaky front. This is an adult. He was swooping on this squirrel and chasing after dragonflies just like the bee-eaters. 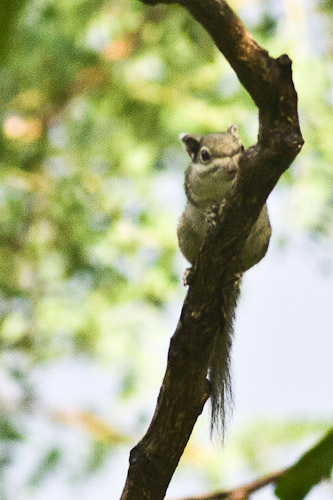 This squirrel was scurrying around the trees near the drongo above. This is race thais with a yellow vent. 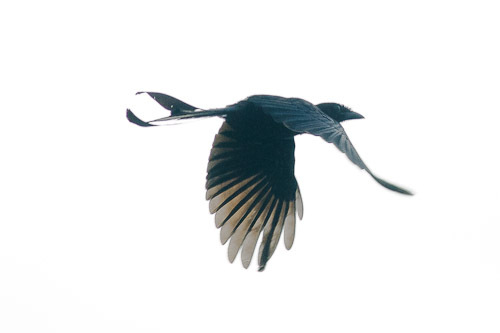 A Crow-billed Drongo (Dicrurus annectans) in flight. 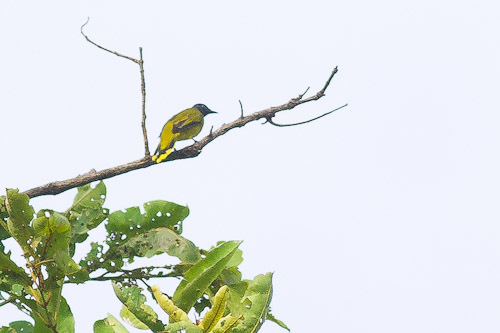 They have a heavy thick bill and shorter tail that curves like the Greater Racket-tailed Drongo. So that is it for this afternoon’s session. I went out this morning and got some more great photos along the same track, so I will put them up when I have got them ready. 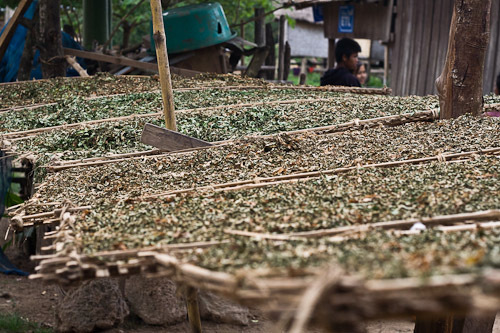 Si Phan Don – 4,000 Islands, Laos. 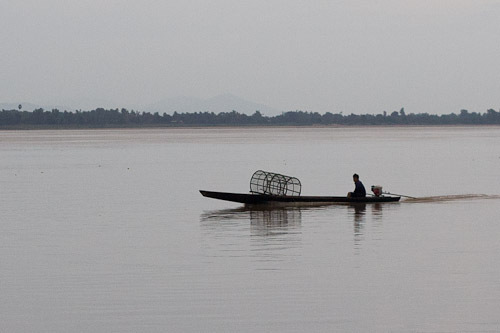 Don Det is one of the 4000 Islands in the south of Laos, just before the Mekong River flows into Cambodia. I followed the road through the center of the island past all the rice fields. Luckily there were a fair few trees spread around and there were some birds. 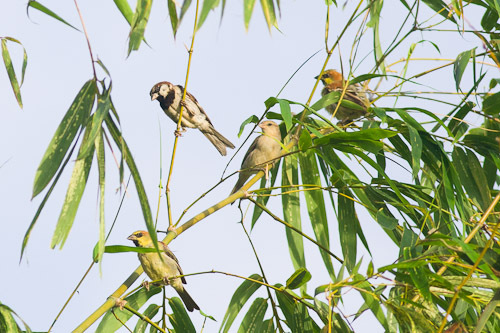 It looks like there are quite a few different House Sparrow (Passer domesticus) in this photo. 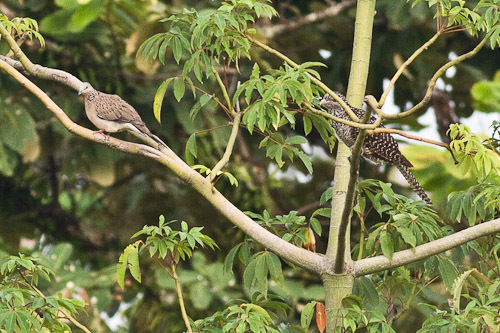 The one on top is male and the lower left is female. I think the one on the far right could be a juvenile male. 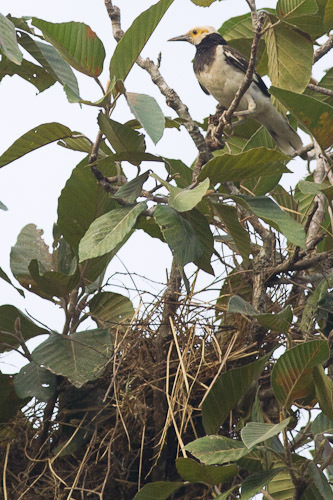 Here is a Black-collared Starling (Gracupica nigrocollis) at the nest. 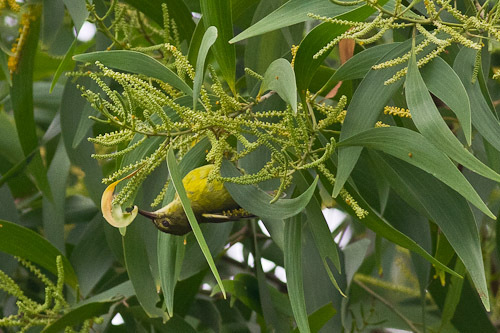 She would fly out to the rice field, pick up a worm, fly to a lower branch, then another branch and finally hop into the nest. 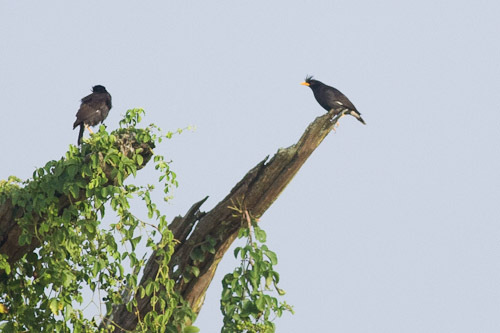 The Asian Koel had probably parasitised the Black-collared Starling nest, seeing that the starling was feeding something or other. In the afternoon, I cycled over to Don Khone and had a look along the old railway track. 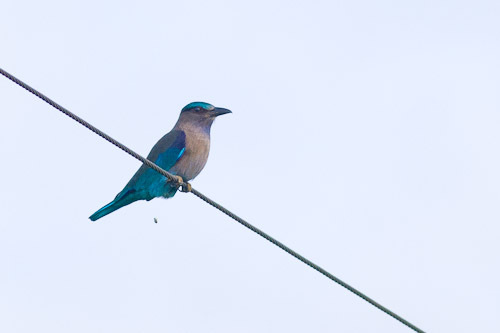 I did not see anything except this Indian Roller on the overhead wire. 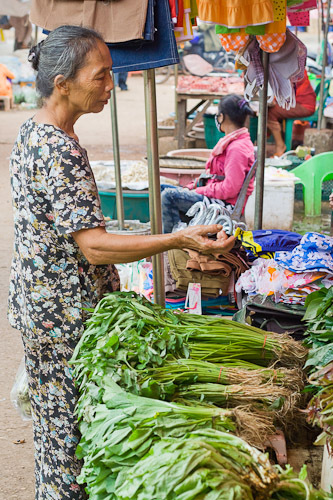 After I returned from Champasak, I still had half a day on the bike, so I ventured over to the Dao Huang Markets, or morning markets, which are about two kilometers away from the city center, near the bridge across the Mekong. 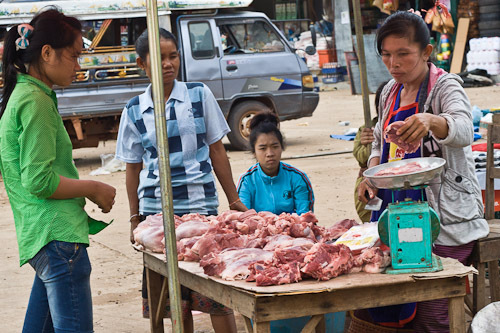 This is normal selling meat out in the open without any refrigeration. 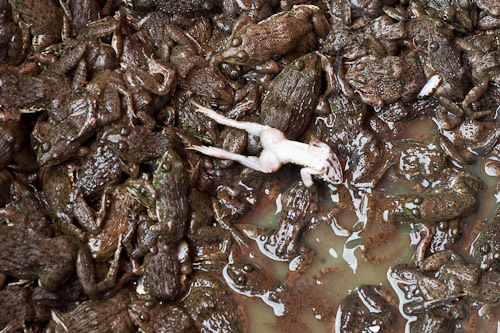 It happens all over South East Asia, Indian sub-continent, South America. Just about everywhere except for the developed world. I am not sure what these are but they look like wild vegetables or bush tucker as we call it in Australia. 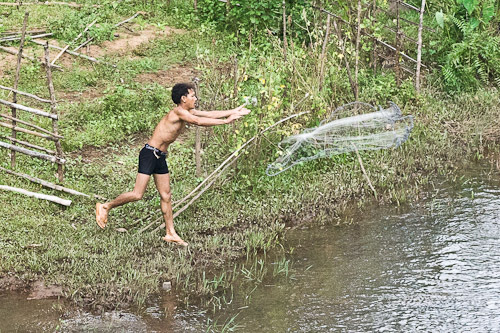 Lao collect weeds along the roads and creeks to eat quite often. This is dried blood from slaughtered animals. 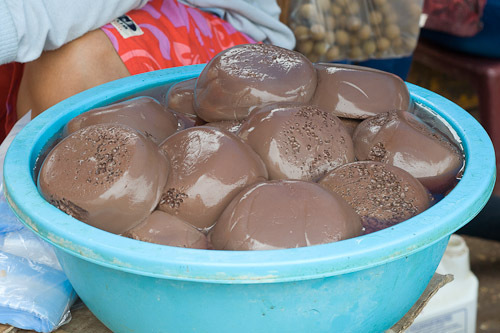 I have eaten some of this in noodle soup in Thailand, not knowing what it was. I wish I did not know. I guess it is a bit like what is in Yorkshire pudding or black pudding but I am not all that sure. 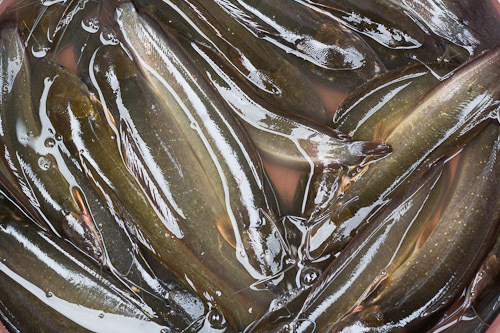 A bucket full of slimy catfish for sale. For the carp, they aerate the water, so you are getting a really fresh fish when you buy one. It is still kicking. 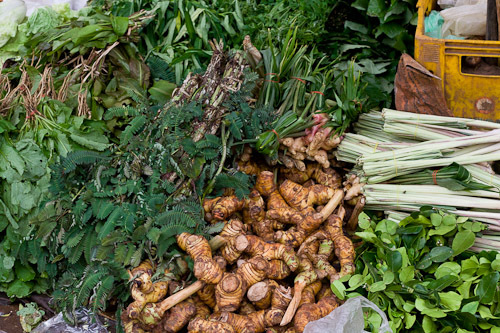 This is how you buy the veggies for the family. 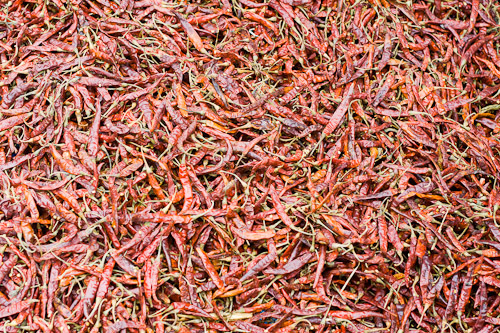 Very hot ones. They usually bake them and put them in a sauce called a jeow. It is very strong. You only need a little bit and it is hot enough. This is very common to see people having a sleep in the middle of the day. They get up really early before sunrise and go to bed early as well. 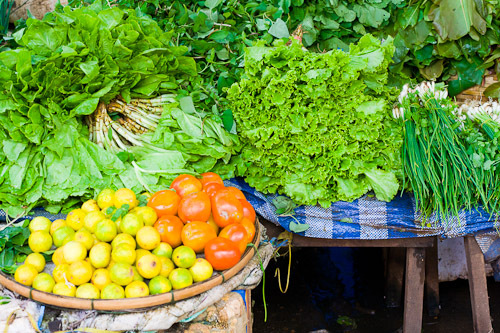 Here are your standard salad vegetables. You get a nice fresh salad when you order a noodle soup. I always eat up my greens. They are yummy. I have a feeling this might be turkey because of the fatty bit around the neck. Not sure. I thought this might have been cinammon at first but it was not. I think it might be used as some sort of medicine. 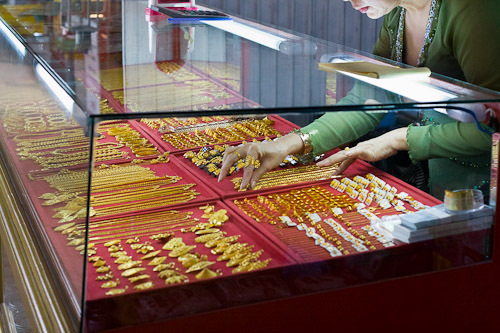 There are heaps of these shops selling all this rubbish. I think it is suss. The colour seems wrong to me. I saw this guy electroplating some jewellery earlier, so I reckon that is what it is. Just don’t tell the missus. The big mess after everyone goes home. Some crew come and clean it all up and the process is repeated tomorrow, and the next day, ad infinitum. 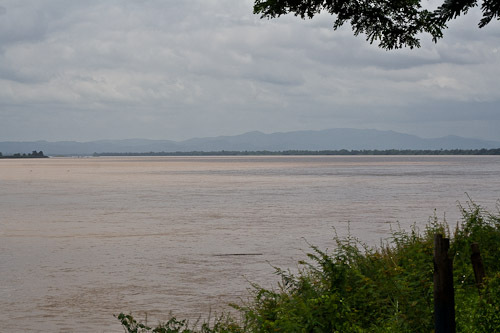 Southern Laos – Mekong River. I finally hired a motorbike. I got a Honda Wave scooter and it is a piece of crap. It is as heavy as a brick and rides like one too. But it was cheap – just over $5 a day. 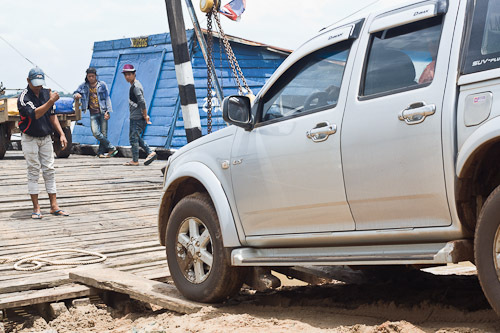 I set off from Pakse and crossed the bridge over the Mekong and turned left towards Champasak. The road was really good. I found myself a cheap guest house and then went wandering up the road to see what I could find. 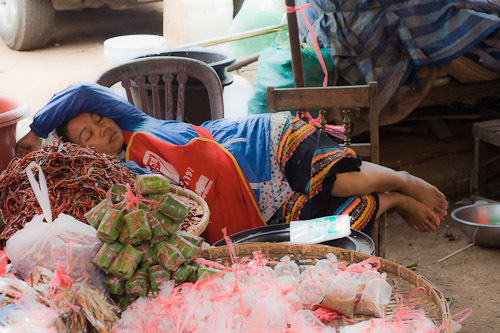 I found myself a sleeping Buddhist near a sleeping buddha temple. It must be a meditation technique. 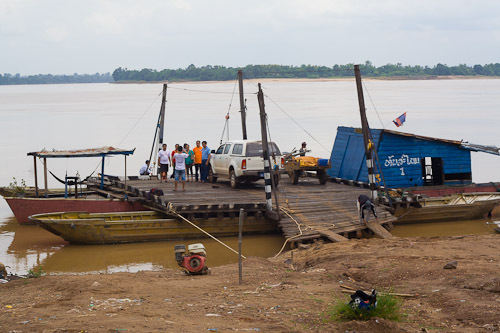 I was fascinated by the ferries going across the Mekong River taking cars and motor-bikes. Here are some tourists driving onto the ferry. The ramp is on a block and tackle and the captain has to lift the ramp off the bank by pulling the chain! Everyone spits a lot here. It is disgusting. 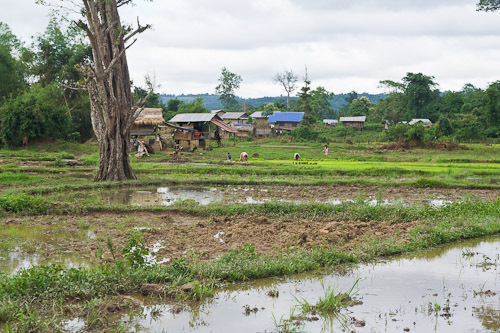 Some of the scenery around Champasak to the west. There is a huge mountain behind it. I tried to find a track towards it but ended up on a mud path. My bike was hopeless and could not handle any bumps or mud. I pulled the Clarity way down to zero for this photo to get that hazy effect. I went back to the ferry landing in the afternoon. Here are some sand barges on the bank. 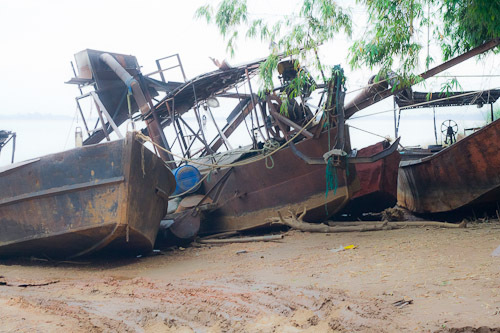 They would dump the sand off the barge and then a gang of men would shovel the sand onto a truck who would cart it away to wherever the construction site was. A fisherman taking pots down the river to catch some fish. 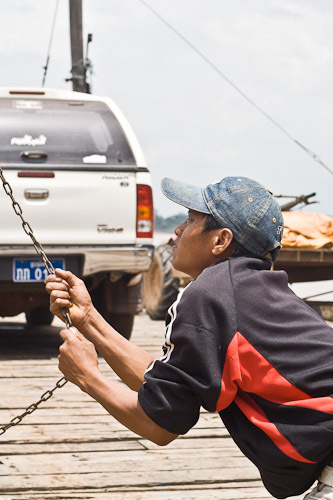 Having a rest before setting off to work ferrying vehicles across the mighty Mekong. Today was an expedition on bike to the waterfalls surrounding the Tad Lo area. The first waterfall going upstream is Tad Hang. Then there is the Tad Lo waterfall. 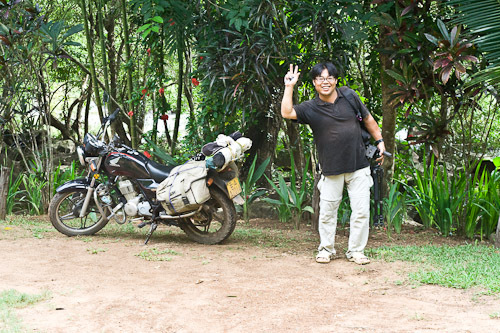 I went with Zou, who travelled all the way from China on this Honda 125 motor-bike. We walked in to photograph the Tad Lo falls and most of mine turned out crap. 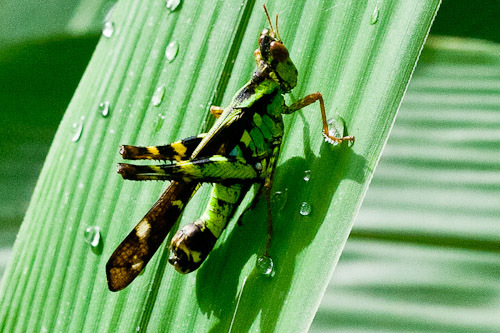 I did manage to photograph a nice green grasshopper who jumped right into my path. My battery died again at this stage so I had to go back and get the other one. When will I ever learn? We eventually made it to the top of the Tad Stoung waterfall but you could not get a very good view. 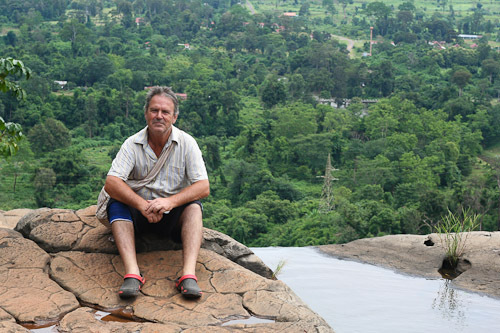 After that we went down to the bottom of the waterfall at Ban Khiang Tad Stoung village. Zou gave out a few cigarettes which were gratefully received. 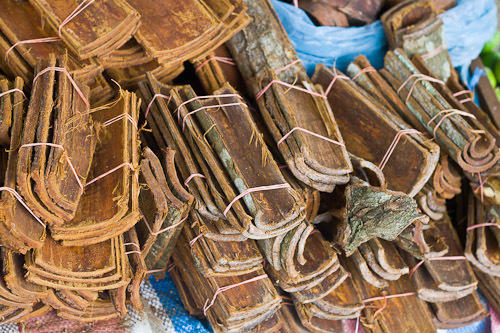 They were smoking their own home-grown tobacco rolled in paper or leaves. 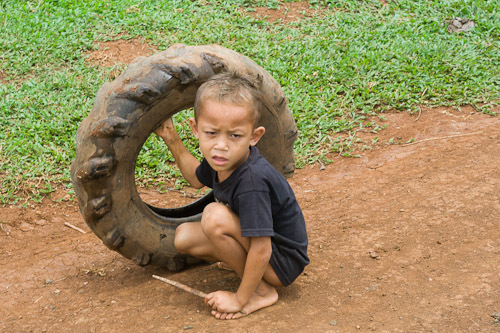 I cannot believe how grumpy this kid was, even though he had a tyre and a stick. What more could you ask for? 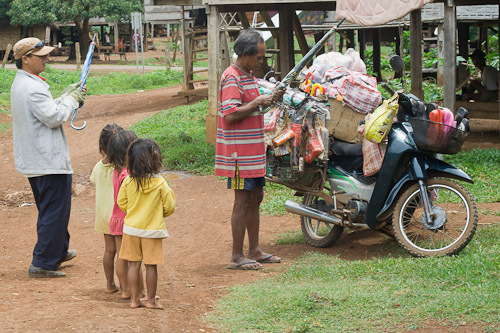 This tinker came on a bike selling odds and ends, but the villager was mainly interested in the umbrellas. We then trekked down to the river, heading up towards the bottom of the waterfall. These kids followed us, so we had to take their photos. This kid had a bamboo boat which he paddled across the creek with a stick! This kid was like a fish in the creek, a true waterman. 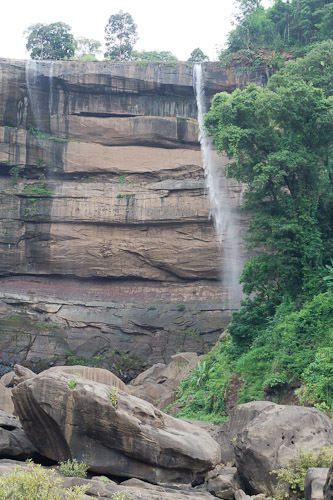 The Xe Set River starts in the north of the Bolaven Plateau and continues to the highland’s edge until it plummets ninety meters off a vertical cliff at Tad Soung Waterfall. After that we went to a Katu village, Ban Lanong. 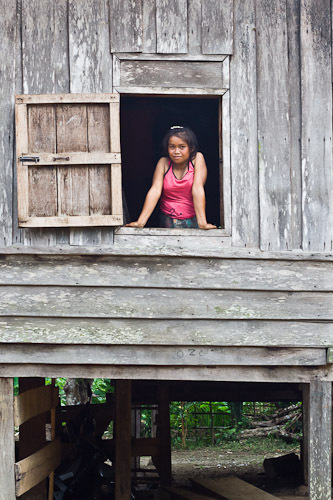 The villages are built around a spirit house and previously Katu women tattoed their faces. 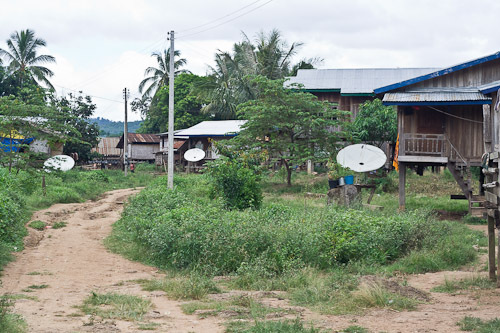 The most strange thing about these villages is that you see a lot of satellite dishes beside bamboo huts. It seems quite incongruous to me. All I have been wanting to do since I have got here in the bush is to sleep. I am so tired now I can hardly keep my eyes open. It must be the fresh country air and the long walks. I set off late today – 7am. I followed the same path as yesterday basically – up along the tracks to the waterfalls. I saw this track off to the right which led up a hill to some sort of aerial. 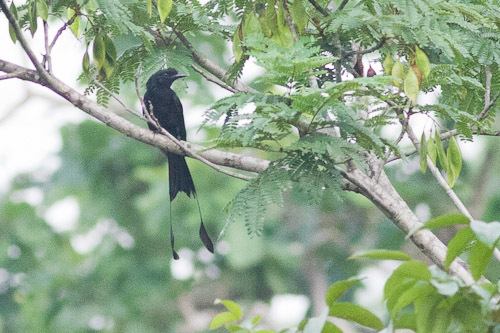 There was a whole heap of screeching and eventually I got a shot of what I thought was a Lesser Racket-tailed Drongo with an actual tail. But no, it turned out to be a Greater Racket-tailed Drongo. 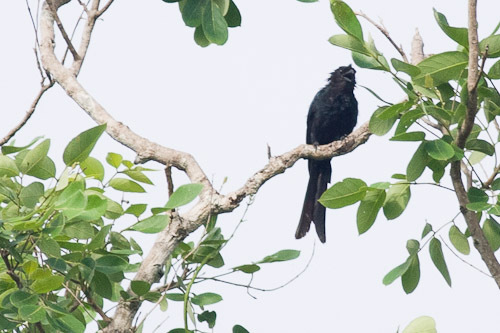 They are different from the Lesser Racket-tailed drongo in that they are larger, have a tufted forehead, a forked tail(the lesser has a square tail) whose shafts end in twisted pendants. 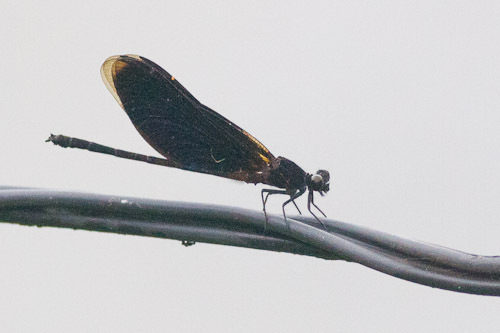 This black dragonfly was on the phone wire going over the bridge. 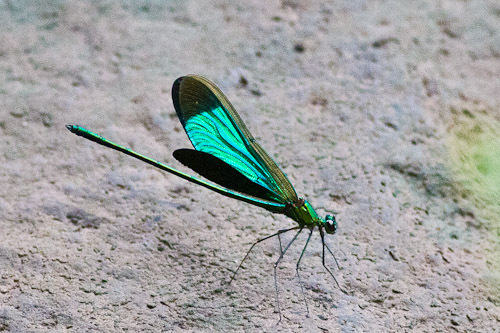 I managed to get one shot of this dragonfly with its wings spread a little. They only did it spasmodically and it lasted a millisecond. 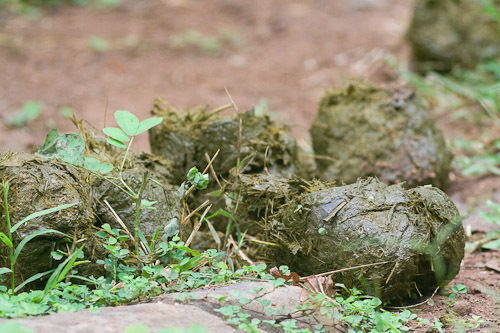 I saw some elephant dung by the side of the road and decided to track down this pachyderm. 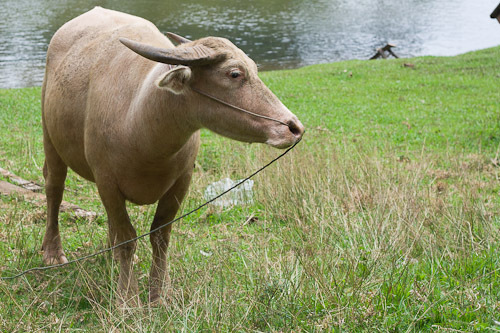 His trail led down to the river, but no heffalump was to be found. I was hoping to find a wild elephant bathing in the river. I am allowed to dream. Update: I had been tracking a tame elephant of course. I happened to find where they take tourists on their rides and cross the river. ha ha. I caught the eight o’clock bus from Pakse to Salavan at the VIP bus station. 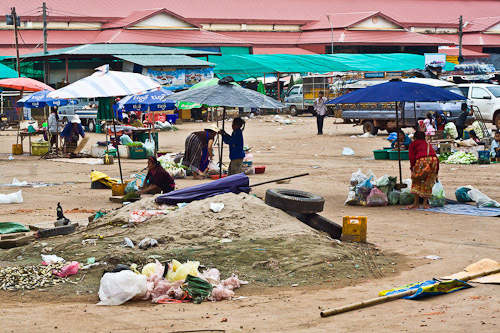 But I had to change busses at the southern bus station which is at the markets about eight kilometers from town. I had to walk a couple kilometers into the village of Tad Lo. Luckily it was overcast and a bit cooler than usual, so it was not too bad. 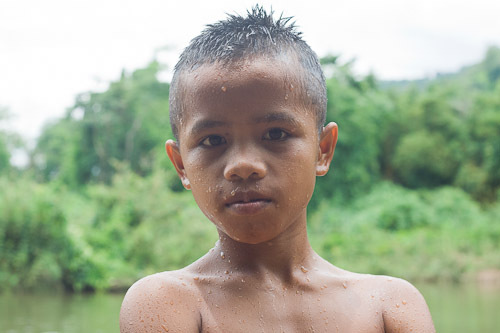 I found a guest house that cost $1.20 a night, had a shower and took off with the camera up the river. 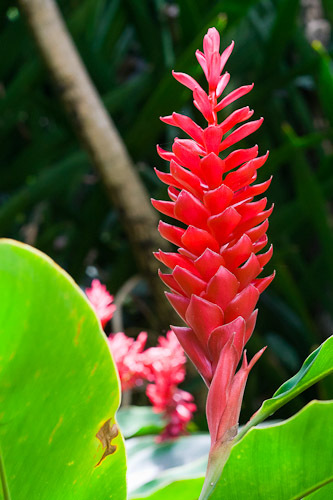 There were lots of bright flowers about. Red seemed a common theme. 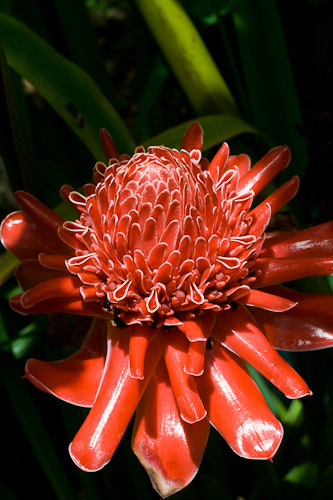 This one looks a bit like a waratah, the emblem for New South Wales. Then I saw the waterfalls. There is a couple of them, you go past one and then get to the next one which is the actual Tad Lo waterfall. 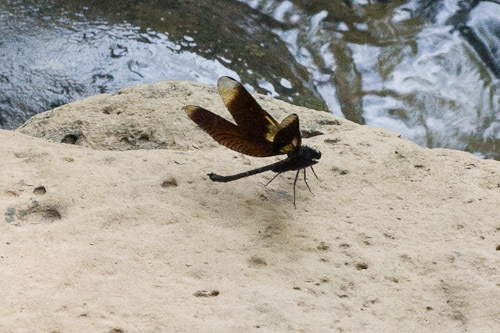 And lots of black dragonflies. And the old throw net. I am still in Pakse, south Laos. 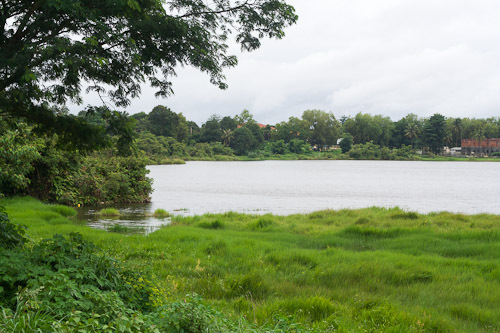 This morning I headed out early and crossed the bridge because I had seen what looked like a stretch of scrub on the headland where the Sedon River flows into the Mekong. 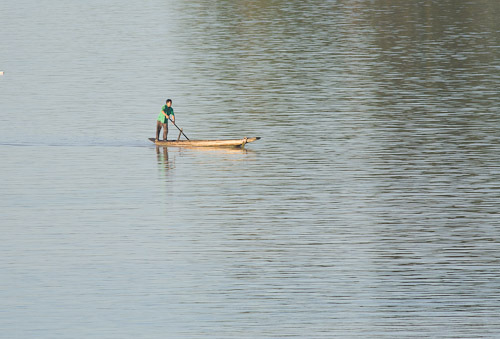 As I was crossing the bridge, I took this shot of a fisherman paddling to work. 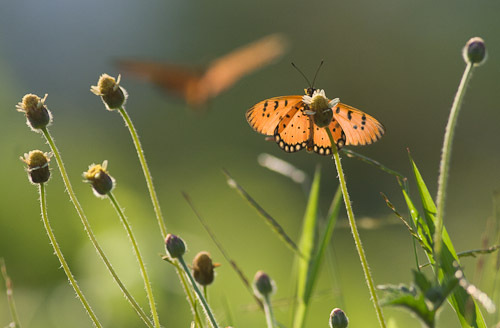 There were a few butterflies around but not as many as I have seen in other places. There is another one in the background hovering. To me it looks like a huge bat. 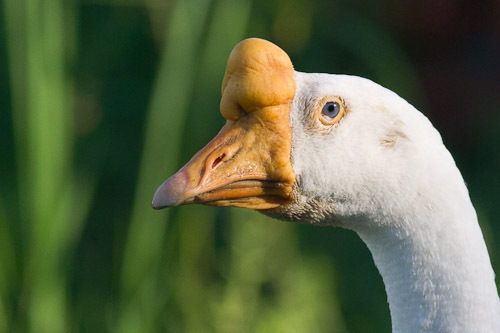 There were some geese in the rice paddies. This ugly critter had a mongrel growth on top of his head. Nice eyes, though. There were a whole heap of birds feeding on the grass near a drain and I thought they were white-rumped munia (Lonchura striata). 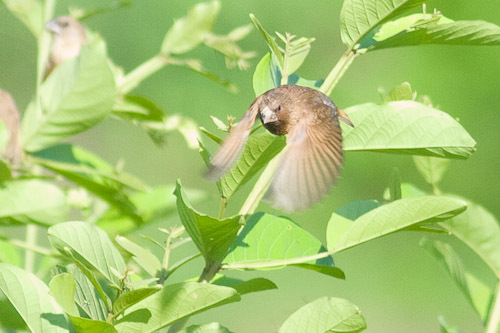 The White-rumped Munia is found in the tropical areas of continental Asia, from India and Sri Lanka, through Nepal and Bangladesh and into Myanmar, Thailand, Laos, Vietnam and southern China. But it weren’t them. They were Scaly-breasted Munia (Lonchura punctulata). 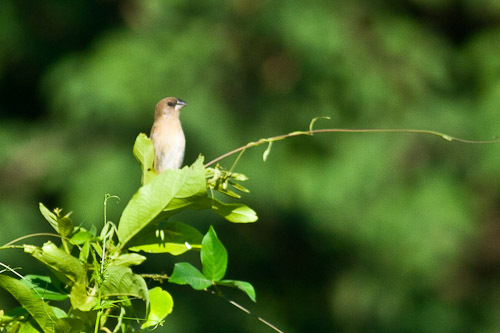 Juvenile Scaly-breasted Munia (Lonchura punctulata) are “Paler and plain above, slightly buffish drab brown below, lower mandible paler than upper” (Robson).